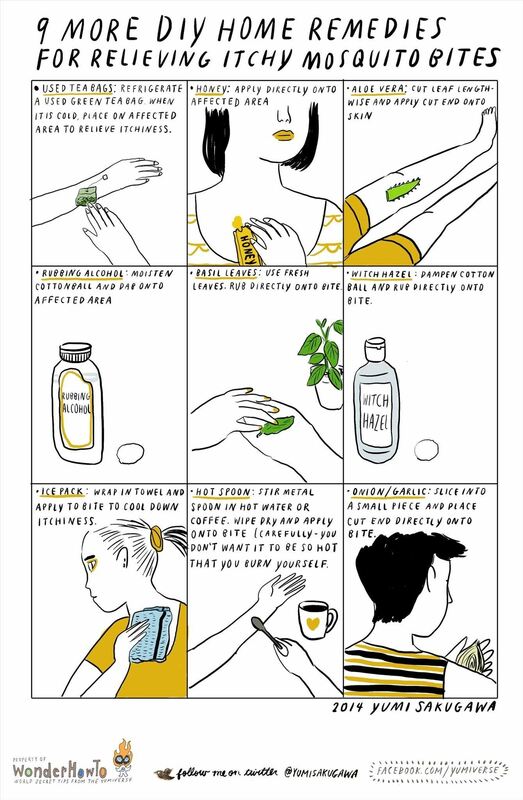 You can buy salves and creams from the drugstore created specifically for relieving itchy mosquito bites, but it's far less expensive and more convenient to use a home remedy that can probably be found in your kitchen or medicine cabinet. Drinking coffee in the morning? Stir a metal spoon in your cup, dry it, then apply the hot spoon directly onto your bite. Or, if you're more of a tea person, refrigerate your leftover tea bag and wait for it to get cold before pressing onto the affected area. Don't forget that you can also use onions, witch hazel, honey, rubbing alcohol, and more. For more tips on relieving bites from these blood-sucking flies, see my original post, 9 DIY Home Remedies for Relieving Itchy Mosquito Bites. For a more preventive approach, see my 5 DIY Mosquito Repellent Secrets.